Another Gorgeous New Poster: Terrence Malick's 'The Tree of Life'! Wow. I would ask where all the new posters are coming from, but with CinemaCon this week (formerly known as ShoWest), the exhibition for movie theaters where they unveil a lot of big summer movies, it all makes sense. There's another simply incredible new poster that I must feature, this time for Terrence Malick's highly anticipated new film The Tree of Life, starring Brad Pitt, Sean Penn and Jessica Chastain. I just love this poster because it takes all of the beautiful imagery that is packed within the film and puts it on one beautiful poster. I love it, I'm sold 100% already, but I was before. Check out this great poster below! I wish we had high def, but this is as high as it was on IMDb (for now). Watch the first trailer if you haven't! From Terrence Malick, the acclaimed director of such classic films as Badlands, Days of Heaven and The Thin Red Line, The Tree of Life is the impressionistic story of a Midwestern family in the 50's. It follows the life journey of eldest son Jack, through the innocence of childhood to his disillusioned adult years (Penn) as he tries to reconcile a complicated relationship with his father. Jack, as an adult, finds himself a lost soul in the modern world, seeking out answers to the origins and meaning of life while questioning the existence of faith. Through Malick's images we see how both brute nature and spiritual grace shape not only our lives as individuals and families, but all life. 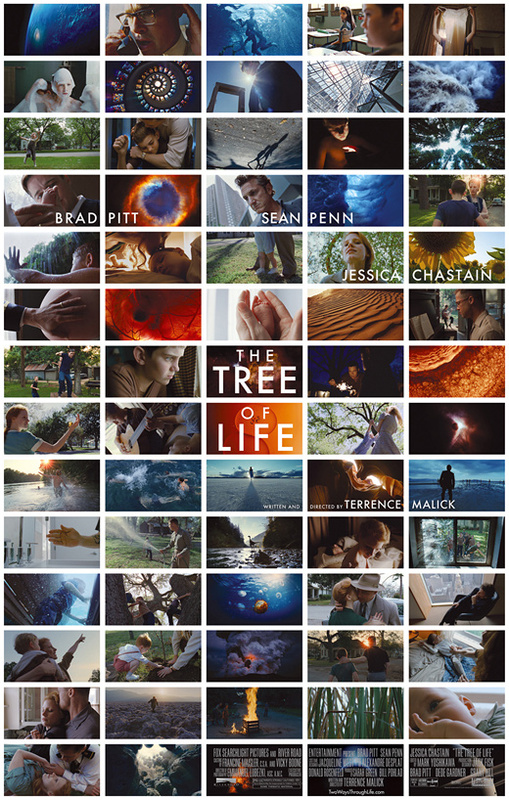 Fox Searchlight is bringing Tree of Life to theaters starting May 27th. Purely Original!!!!! I love it!!! Anyone else notice the shot of what appears to be the dinosaur that was talked about? Yep, right in the middle below the logo. Ya, I can't wait to see where he takes us on this journey, obviously spanning quite a bit of time. Bring it Malick! That's a good theory...I'm very excited for this film. By far, one of the coolest posters I have ever seen in a long time. And it is so simple, that's the key of it all! I have to say I'm actually a little disappointed with this poster -- most of the images are just stills from the trailer -- I was hoping that it would be something more beautiful than this sort of tile thing they're doing. I'm still excited for it though! i quite like the tile approach - it's different, contains no floating heads, and makes you want to look in more detail, and then look again. perhaps we'll get additional posters using some of the more beautiful single images from this one, or something similar. the only other posters for the film i have seen so far are of a baby's foot and a tree, neither of which does it for me like this does. I'm going to watch this film just because of that amazing poster. OMG...what is it about??? I hate being kept in the dark...Now there are dinosaurs in it? loll Seriously WTF? it means its gonna be an epic. Beautiful - it definitely grabs my attention!